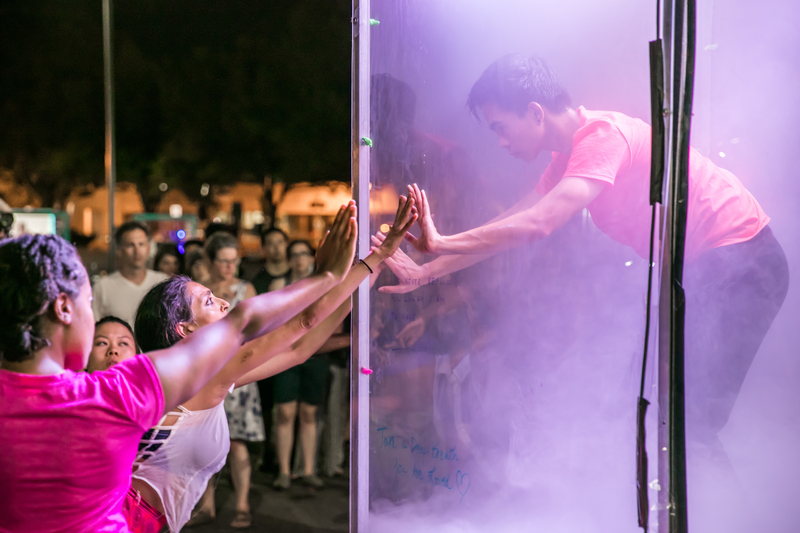 The theme of this year’s Northern Spark takes its cue from the festival’s venues in downtown Minneapolis: The Commons, Minneapolis Central Library, and Nicollet Mall. What is a 21st century commons? A 21st century library that serves everyone? A pedestrian avenue that is open to anyone? At a time when the darkest parts of our collective identity surface daily in public forums — overt racism, casual sexism, challenges to our rights to free speech, policies that fly in the face of climate science — we at Northern Lights.mn are committed to providing platforms that resist discriminatory ideas, open dialogue and create relationships. What do we have in common? More specifically in the context of Northern Spark, what do we share when we gather together in physical space? We recognize that this is a difficult and maybe even dangerous question. Too many times, appeals to the “common good” are just calls to support the established order gussied up as unquestioning patriotism. Don’t kneel because it disrespects. All Lives Matter. Don’t rock the boat. Is it possible to share common ideals and goals while acknowledging significant differences in heritage, lifestyle, income and interest? What do we have in common in a city with significant racial disparities in employment, education and other markers of well-being? Can there ever be common ground on land that was colonized? And what do these questions mean for Downtown Minneapolis — one neighborhood in the midst of many in our metropolis? We dream of dynamic, shared spaces. A commons that is available to everyone for collective and individual purpose. We dream of information as an inalienable, human right. A library that preserves the past stories of everyone as context for a future that embraces anyone. We dream of a city center that is a vibrant meeting place of diverse goods and services and ideas beyond what we can even imagine. What are your dreams for the future that we can have in common? My Night is a feature that lets you create a customized list of the projects you want to see at Northern Spark. You can add (or remove) projects using the "My Night" button — look for it on the Artists & Projects list (below each project image) as well as on individual project pages. Your “My Night” list can be printed or shared and is viewable on the festival’s mobile site. Please supply your e-mail address below for your own unique My Night account. Your address will not be shared or distributed, and you will receive information only from Northern Spark. Sorry you have not added any projects to your night. When you do, you then will be able to share it with all your friends.